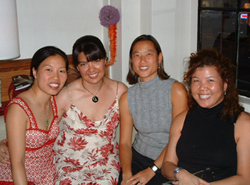 The Portland metro area is home to a diverse community of Asian Pacific Americans. It’s no wonder there are plenty of business networking opportunities for APA entrepreneurs and professionals or those who are interested in making connections with Asian business leaders. Here's a short list of premier business groups targeting the APA professional and entrepreneurial community. Pictured from left: Gloria Jung, ORIENTED.COM Portland co-organizer; Diana Snell, Nishiura Rokusuido, a Japanese antique specialist; Kristin Johnson-Shadley, Wells Fargo Foreign Exchange; and Anna Low, AL Designs. As part of a global network of international professionals interested in Asian businesses and cultures, ORIENTED.COM members "simultaneously" host happy hours in cities across the globe, providing networking opportunities and information exchange. Here in Portland, up-and-coming Asian-American business leaders and entrepreneurs come together on the last Thursday of every month for ORIENTED happy hours, held in downtown Portland. “We attract a lot of dynamic and brilliant people who want to meet other professionals in the area who are interested in Asian culture and developing business relationships,” said Gloria Jung, one of the founders of the Portland chapter. Many professionals and entrepreneurs who come to networking happy hours have overseas experience and are eager to make connections with other folks who share their passion for growing their personal and professional networks. Members enjoy the benefits of a global professional network, said Jung. “If you’re traveling overseas, you can attend an ORIENTED happy hour and expand your network,” she said. Since the group started meeting in Portland in January this year, networking events have drawn some 30 professionals and entrepreneurs. When she first approached ORIENTED.COM organizers about her interest in creating a Portland chapter, Jung said the founders were enthusiastic, yet unsure about the viability of sustaining a local chapter. Compared to other West Coast cities such as Los Angeles and San Francisco, the Asian-American population in Portland is not as large. The AABA seeks to promote the formation, growth and prosperity of Asian-American businesses in Oregon and Southwest Washington. Through meetings and networking opportunities, the group is helping advance the personal and professional development of Asian-American entrepreneurs, professional managers and executives. According to Lillian Tsai, AABA president, the organization is the first of its kind in Portland, Oregon and Southwest Washington. “The group was founded as a grassroots organization in 2003 with the goals of networking and business partnership opportunities for all our supporters. Our success is very much dependent on our members’ input and support,” she said. 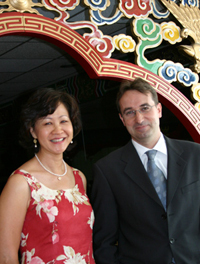 Lillian Tsai, with Murray King, Oregon's China Representative for APCO in Shanghai. Oregon-based corporations and business owners who are interested in doing business in China owners who are interested in doing business in China benefit from participating in activities hosted by the China Business Network (CBN). The group was formed to provide businesses and individuals in the Pacific Northwest who are involved in trade with China. The main thrust of CBN is to provide businesses with a reliable resource for information on the latest business trends and developments in China. The CBN also provides members and attendees with opportunities to meet and develop relationships with professionals in finance, law, consulting, marketing, communications, academia, manufacturing, etc. in a wide variety of industries. Visit http://www.nwchina.org for more information.